A stretch of the former Berlin Wall which is both one of the most "touristy" as well as one of the historically most significant: It is also home to the "official" Wall memorial with a documentation/visitor centre. Also featured is a reconstructed short stretch of the complete set of border fortifications. 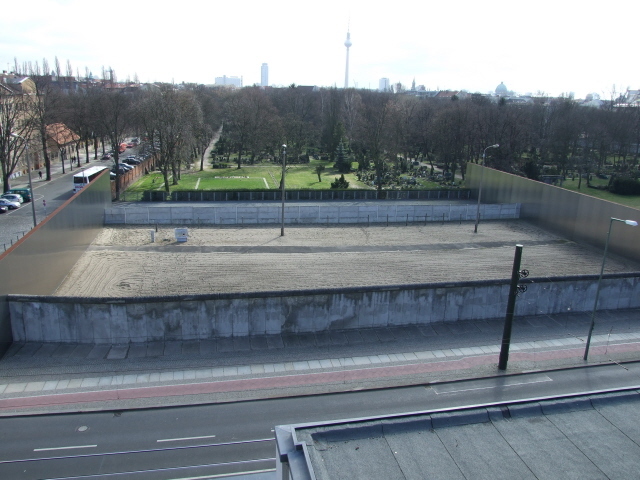 More background info: Several dramatic escapes (or attempted escapes) took place here – right from the start when East Berlin was sealed off on 13 August 1961. The houses on the south side of the street belonged to GDR territory, but the street itself, including the pavement, belonged to the West. Thus the outer walls of the houses facing the street formed the border proper. Obviously, it was easy to cross that border – you just had to step outside and you were in the West. So the first thing the border troops did was to brick up doors and windows on the ground floors of those houses, later on higher storeys too. But people were still trying to get out by jumping out of the windows – into rescue nets held out in the streets on the Western side. Some missed and jumped to their death. There were scenes of actual physical struggle: border soldiers dragging people ready to jump away from the windows to keep them inside, while down in the streets on the Western side people protested and encouraged the jumpers to break free. It was also at Bernauer Straße that one of the most iconic photographs from the days of the building of the Wall was taken – of GDR border guard Conrad Schumann jumping over the barbed wire and thus defecting to the West (in fact, this is one of the most famous photographs of all time!). Later there were also a number of (attempted) escapes via tunnels dug under the border and Bernauer Straße – more than at any other part of the border – including the (in)famous "Tunnel 57" – cf. Checkpoint Charlie. The latter has now been included in a special tour offered by the Berliner Unterwelten. Finally, right in the middle of the 'death strip' of the border there was a church which the GDR blew up as late as in the mid-1980s – an act much deplored in the West. Long before that the residential buildings on the GDR side of the street had been demolished (after the residents had been forcibly evicted and moved elsewhere) – all to make room for the construction of the modern border security systems. Part of the territory of the cemetery on the Eastern side was similarly "cleared". After the fall of the Berlin Wall, while most of it quickly disappeared completely, a stretch of the outer wall remarkably survived here. This was declared a listed historical monument in 1990 and the whole site made a memorial in 1998. Over the next few years the site was developed, in a succession of phases, to become the memorial complex that today constitutes the "official" Berlin Wall memorial (scheduled to be finished some time in 2012, but most of it is by now in place). Together with the former Checkpoint Charlie this now forms the most popular site for Berlin Wall tourism. What there is to see: Most importantly, Bernauer Straße features one of only three stretches of original outer Berlin Wall in the city that survived (the other two are at the Topography of Terror and at Liesentraße – see fragments), namely of the "4th generation" or "75" type, i.e. the most iconic incarnation of that concrete monster. 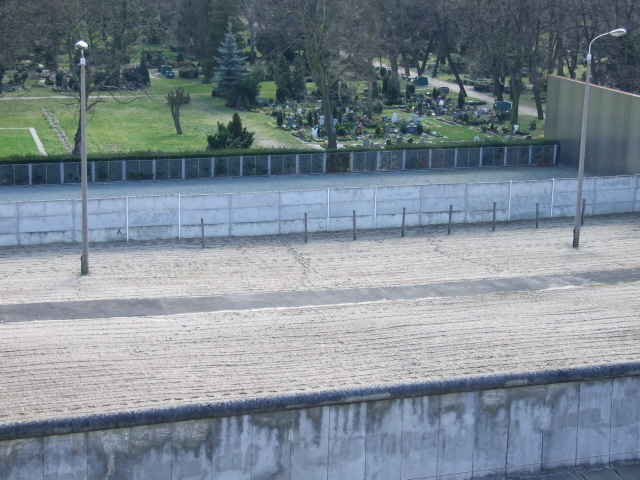 The first half of the stretch of Wall, seen from the western end of the strip near Nordbahnhof, is still visibly battered by "wallpeckers", who chipped and chiselled out fragments (as souvenirs) in the early days of the fall of the Wall. Worse still, there's a big gap in the Wall, where several segments were removed even long after the site had been declared a listed historical monument (see also East Side Gallery for a similar such case). The gap is now "filled", somewhat inefficiently, by thin red-rusty steel poles of the same type as those that mark the continuation of the former course of the wall further east. There's lots of faded graffiti on the back of the wall – i.e. on the former Eastern side, so this cannot be original and must be post November 1989. Ironically, a "danger" sign warns of a piece of bent metal that pokes out of the wall at one point – so some risks are still present when walking around here. The main part of the wall memorial is a reconstructed section of the whole border strip. The outer wall has been restored here, i.e. plastered with concrete to cover the damage caused by wallpeckers, so that it looks more authentic (even though in another sense it actually is less so). There is no graffiti on it, though, as there would have been back then on the Western-facing side of the wall. Behind the wall the death strip has been partly reconstructed. Intriguingly (though utterly unrealistically, of course) you can walk around one side of the Wall Monument to its "back" – i.e. to the GDR-facing side. And here you can peep through gaps in between the concrete slabs of the rear wall of the death strip. Inside is no more than an old distributor box standing in the smoothed sand together with a couple of original lamp posts … and a watchtower, which is a recent addition (and a reconstruction, i.e. not authentic). OK, in reality there wouldn't actually have been any such gaps to peek through, but still: it's probably the best impression of a glimpse of the Berlin Wall from the Eastern side. But had you been standing here back then when the Wall was real, you would have been in serious danger just being here! Several fragments of the inner wall and other remnants of the forward border security installations are to be found around the area too – including some further segments of graffitied Wall placed separately in a row (rather than in the form of a closed wall). Next to it are a few remains of the pipes that used to crown the top of the wall. It looks a bit rubble-like compared to the reconstructed border strip, but adds a certain archaeological authenticity all the same. A comparatively long stretch of former border strip is still open land, i.e. not built up (as elsewhere), with parts of the former patrol track still in situ stretching eastwards. In recent years this area has been comprehensively "landscaped" and integrated into the memorial complex, especially towards its western end between the documentation centre and Nordbahnhof station. More developments are under way. In other words, the commodification of the site is not yet finished. Inside the former border strip, a short distance east of the documentation centre, there is the modern Chapel of Reconciliation – on the site where the old church blown up by the GDR authorities used to stand. It is here that memorial services are held, attended by top officials and politicians on important anniversaries such as 9 November. Most obviously directed at tourists are a number of information points that have now been installed in various places along the former border. Mostly these have the form of slim columns, offering background information through video screens, audio tracks and/or the classic text-and-photo panels. All of this is bilingual (English and German). Map panels also provide an overview of the different sections that the memorial border strip is subdivided into. Furthermore there are relief models (in the same rusty metal) of the area to provide a very rough overview. The rusty-metal design is continued also in the wall-of-names-type monument, entitled "Windows of Remembrance", which commemorates the "Mauertote", i.e. those who were killed in this area as they tried to flee across the wall to the West. Most are given a portrait photo – in a semi-transparent reproduction so you can actually see the wall behind them! A few individuals lack the photo, but all are named. People often lay flowers in the individual niches. Another recent addition to the site are the large panels and large photos/murals – on the blank façade of the last house on Ackerstraße. These include a before-and-after set of images illustrating the developments at this stretch of the border. Of the other border installations, only a few remains in the ground are still in situ, and a couple of them have been fenced in to form low "pens". The crude remains inside are a curious form of archaeology, really. If it wasn't for the fence and information panels, no one would even pay any attention to these rudimentary bits of crumbling concrete. There's a viewing platform on top of a tower over the documentation centre from where the reconstructed border strip can be seen best. This is the only part of the Berlin Wall with both outer border wall and inner wall with an indication of the "death strip" in between. Little photos (and explanatory texts alongside) are etched into slim steel panels at the railings on the top of the observation tower to provide a vague impression of what the site really used to look like. The recent addition of a reconstructed watchtower is little more than a rather feeble attempt at heightening the sense of (false) authenticity, but makes for an intriguing contrast with the documentation centre's own modern observation tower! In addition to the documentation centre and the open-air information points, guided tours are offered both inside the centre and outdoors in the immediate vicinity, e.g. to the sites of the escape tunnels, as well as further afield to other sites and fragments of the Wall. At the western end of the complex, a new visitor centre has been built (again incorporating a rusty-metal-look façade), and this is where tours now start and where the large bookshop is located (relieving the documentation centre of these functions, from where they were relocated here). It's just opposite the Bernauer Straße exit of Nordbahnhof station and makes for a good starting and/or finishing point of a visit to this rather comprehensive site. Access and costs: easy and free. Details: very easy to get to, either by S-Bahn regional metro train (S1/2/25) via Nordbahnhof station or by U-Bahn (subway, metro) U8 to the station actually called Bernauer Straße. Or simply on foot – e.g. from the central station (walking east) or from Friedrichstraße (walking north). The sites of the Wall and all other open-air parts of the complex can be visited for free at all times (except for the inside of the reconstructed death strip, which is out of bounds to visitors). Opening times of the documentation/visitor centre: Tuesdays to Sundays 9:30 a.m. to 7 p.m. (only to 6 p.m. in winter – November to March). Admission free. Guided tours do cost money, although those offered by the documentation centre are very reasonably priced. Time required: If you only want to cast a quick glance at the remains of the Wall and the reconstructed bit near the documentation centre, then half an hour to 45 minutes is all that's required. Extra time will accordingly have to be allocated to visiting the exhibition inside the documentation centre. Browsing around in the bookshop can also take up quite some time if you're interested in the topic. The same is true for the area around the documentation centre that is becoming increasingly commodified for tourism. In essence: you have a choice of either a superficial visit, of less than an hour's duration, or spending the better part of a whole day here. Or anything in between. For some it may actually be a good idea to go on a guided tour to get a more structured visit. Combinations with other dark destinations: in general see Berlin – more specifically see Berlin Wall and even more specifically Wall fragments and remains. The closest other related sites are the "Mauerpark" ('Wall park') towards the north-east, and towards the west the grounds of the Nordbahnhof or 'Northern Station', with its exhibition about the former ghost stations (of which it was one), and a few Wall remains. The regional train station "Gesundbrunnen" isn't far either – that's where the "Berlin Underworld" tours of bunkers start – and they also offer tours at Bernauer Straße with an emphasis on escapes through tunnels (naturally). Those with a penchant for atmospheric cemeteries can find a pretty good one just south of Bernauer Straße. This used to be partly forbidden territory back then and at the northern end, towards the Wall, the border installations ate into the cemetery itself, i.e. parts of the tombs were removed to make space for the border strip! A reconstructed piece of cemetery wall right by the Berlin Wall remains gives an indication how far the cemetery used to extend. Combinations with non-dark destinations: see Berlin – in the immediate vicinity of Bernauer Straße there isn't much else to see for "normal" tourists; but the location is close enough to the many attractions in the district of Mitte that it is walkable, or else just a couple of stops away on public transport.